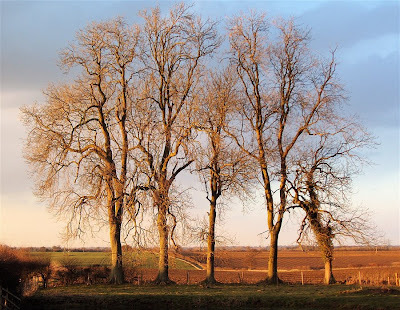 This group of ash trees stands beyond the meadow at the end of my garden. 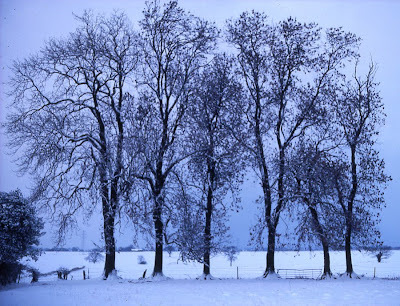 The earliest photograph was taken in the mid-1980s when there were six trees. I think the gales of 1987 took the tree on the right away, and in the last few years another tree has been steadily leaning into its neighbour. In the snowy picture you can just make out the roof of a barn between the two trees on the left. That, too, was damaged in 1987 and subsequently demolished. 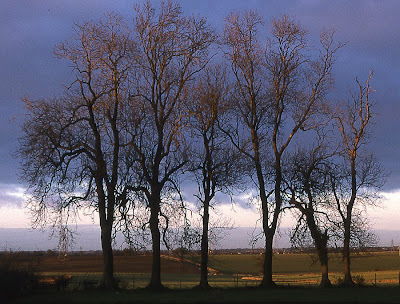 The ash trees make my garden what it is because of the way they frame the northern landscape with those arches between their trunks. Everyone who walks through the hedge into the back garden exclaims at the view, but it's the trees that turn a straight horizon into a series of windows and draw your eye to the narrow band below the horizon where you can see distant marshes, windmills, churches and villages. You can even see wind turbines flashing in the sunlight a dozen miles away on the coast. I like to think that I live on a hill. Even if it's only 30 metres above sea level I have the comfort of knowing that there's no higher land between me and the North Pole! pulps from the bothy features a banjo-playing Jerry Garcia today. As it's Red Nose Day here's a banjo joke. A band has arrived early for a gig so they lock up the cars and go in search of a drink, but on the way to the pub the banjo player suddenly stops. 'Hell!' he says, 'I left my banjo in the back of the car where anyone can see it. I'll have to go back and cover it up.' The rest of the band sigh, but they walk back to the car with him. When they turn the corner they see that the rear window has been smashed. The banjoist breaks into a run. When the others catch up they find him staring into the car in astonishment. There is now an extra banjo lying on the back seat! There are similar jokes about other instruments, especially bagpipes. I like this one. Q: Why do bagpipers walk when they play? A: To get away from the noise. But back to banjos. All those jokes are really very unfair. A friend of mine once pointed out to me that a banjo player can always draw a crowd, and most of the banjoists I've met have been friendly, helpful people. 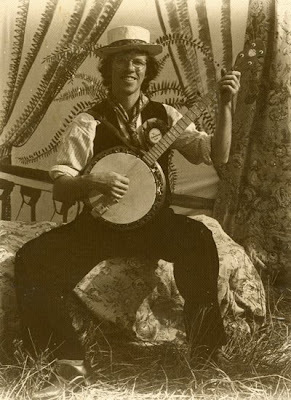 As an example I give you Mikel Iverson from Utah who has provided, absolutely free, a wonderful online archive of tablature for the clawhammer banjo. 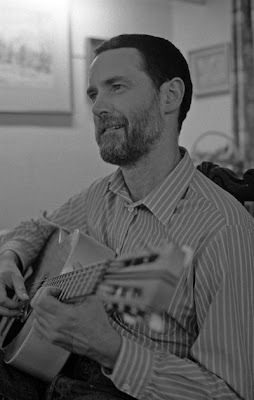 If you want to know what clawhammer banjo sounds like then visit his website, because he has also made beautifully clear little recordings of all the tunes he has transcribed. It's better than most of the books you can buy on the subject. The picture shows a far younger version of myself with an old 'Broadcaster' banjo which was covered in tasteful yellow pearlite. This is from the late eighties when The Moles were at their peak! I have to mention also that Class 1C at the school where I work made a great little movie about Anansi. They had already composed and performed the music to go with the story and their teacher helped them to create the animation. You can see it online here. It was Duncan who told me that when you tell a story, or sing a song, the person you heard it from is standing behind you. When that person spoke, he, in turn, had a teller behind him, and so on, back and back and back. I love this idea, the story has to speak to its own time, but the teller has also to be true to the chain of voices that inform him or her. You can read more from Hugh Lupton about storytelling here. 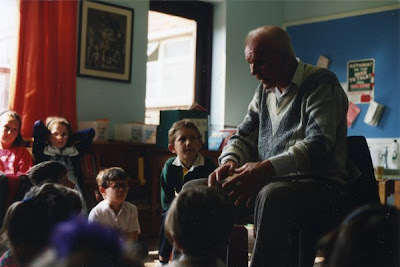 I was lucky enough to spend a whole day with Duncan, listening to him telling the children story after story, interspersed with songs and tunes on the harmonica, and I often tell stories that he told that day, hearing his voice in my head. He had a very special way of beginning a story so that you were aware that it was part of that chain of voices. Here's an example from The King and the Lamp from Fireside Tales of the Traveller Children. Now, I want to tell you a good story, and I hope you're going to like it. 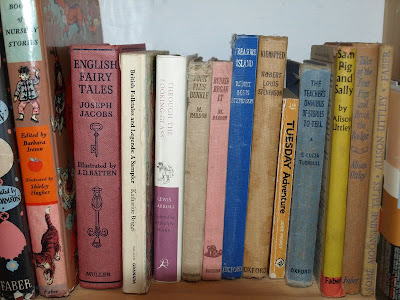 The story is one my daddy used to tell me when I was wee, because I was very fond of a story and I used to say to him, "Tell us some stories Daddy!" See, when we were carrying on and being wild, Daddy used to say, "Come on and I'll tell you a story!" So you be quiet and listen. And some day when you're big and have wee babies, you can tell them the same story I'm telling you!" No one can resist that invitation - "Come on and I'll tell you a story." Children who are angry, fed-up, bored or even out of control go quiet. They want to know what happened. Somehow, by telling a story you give it weight, because it's coming directly from you. There's a kind of mystery about where the story comes from, which is the mystery of memory, a direct expression of ourselves like singing or dancing, and I think that's what children (and adults) respond to. Duncan Williamson died in 2007. You can read about his life here. The main part of my teaching job these days is teaching music, and the most important part of that job is teaching singing. I've always sung songs with children, ever since the time when I was a playgroup supervisor in Emily's playgroup, and when I was a class teacher I'd always have my guitar with me so that every day was punctuated by songs. However, I've never been that confident about my singing voice, and until recently I'd never had any training either in singing, or in teaching it. So, after a couple of years of encouraging singing in my school I had children who loved singing, had a great sense of rhythm and were really musical, and I realized I needed to know how to take them to another level. I also figured out that while I was sitting playing the guitar I couldn't help them to sing. I needed to conduct them. The result of all that is that when I saw a conducting course advertised in Great Yarmouth with James Davey I thought it was just the thing. And it was. But it was very hard work, in just the same way that the mountain course I described in an earlier post was. couldn't be greater. When I went for a run this morning I found myself beating time and singing Jubilate Deo. I'm hoping that's not a serious problem.